Все видео пользователя: Berklee Online. Practice playing major, minor, and dominant chords in their inversions can increase your playing speed, harmonic knowledge, and overall guitar technique. 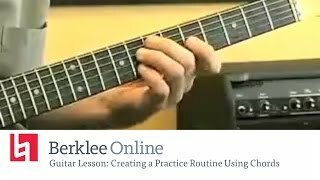 In this free online guitar lesson, Berklee College of Music guitar department assistant chair and Berklee Online course author and instructor Rick Peckham shows you how to create a guitar practice routine using chords. Rick Peckham is an internationally known jazz guitarist, clinician, composer, and writer. He has performed with George Garzone, Jerry Bergonzi, Mike Gibbs, and Dave Liebman, and recorded the album Stray Dog (ropeadope.com) as a member of the notorious jazz collective Um, led by trombonist Hal Crook and occasionally featuring organist John Medeski. His most recent recording Left End—a set of original compositions mixed with collective improvisations—was recently recorded with drummer Jim Black and bassist Tony Scherr. In addition to extensive work in the U.S., he has led or played on tours in Ireland, Canada, Spain, and Germany. Currently Assistant Chair of the Berklee College of Music Guitar department, Peckham has been a faculty member since 1986, and was integral to the development of Berklee's ear training and musicianship curriculum. He organized the college's honorary doctoral tributes to Roy Haynes, Joe Zawinul, Jack DeJohnette, and John Scofield, featuring then-Berklee students Kurt Rosenwinkel, Matthew Garrison, Antonio Hart, Abe Laboriel Jr., Melvin Butler, and Seamus Blake. He is also a prolific and accomplished writer, recently releasing Modal Voicing Techniques, a best-selling DVD for Berklee Press. For this assignment I'm going to listen to you playing root position and first inversion for major seven minor seven and dominant seventh chords this is probably the most challenging assignment in the whole course so it's it's probably going to take some work and it's a challenge but I think you'll find that it's worth it once once you've got it under your fingers so here goes.